Many people already have a good idea of what bothers them about their smile and our goal is to affordably provide you with the least invasive method of getting your desired look. 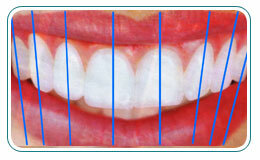 Here are some of the smile principles we use to plan our aesthetic or cosmetic treatment, whether it is tooth bonding, trimming, Invisalign, porcelain veneers, aesthetic crowns, or a combination. 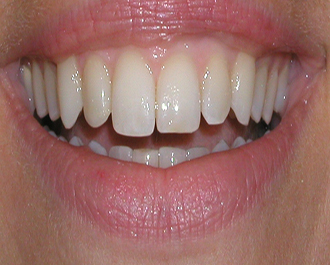 If you want us to assess your smile, come in for a complementary consultation with Dr. Ozanic. Naturally darker or discolored teeth – we are not all born with the Snow White tooth gene and if your teeth were that white when they came in you are in the minority. 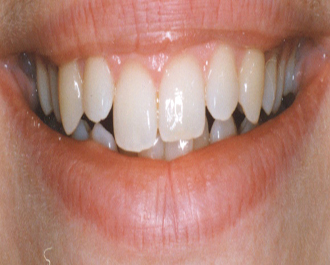 Whitening will bring teeth to their original color, but for some people this just isn’t enough. Possibly it’s because they have a naturally darker dentition, or because their teeth are uneven in color due to developmental stripes or blotches. 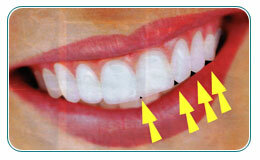 In these cases veneers are the best option. 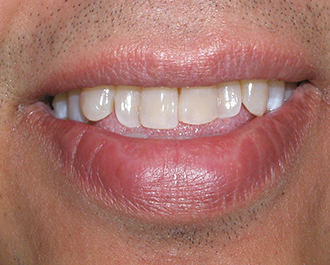 Dental Work – White fillings and tooth colored crowns will not change color with whitening products and so may have to be modified or replaced. Roots don’t whiten – if gums have receded to expose the roots of the teeth they are not going to whiten there and that’s because there is no tooth enamel there to whiten. They also can get very sensitive to whitening products and sealing them and covering them with a light colored material can do the trick. Have a light complexion – Rodney Dangerfield once told the joke – “I don’t get any respect – I went to my dentist – I told him I want whiter teeth – he said ‘Wear a brown necktie!’ “.Teeth appear darker on fair haired, light skinned individuals. Darker lipsticks will make a smile look brighter and using a whitener one or two days before a social event will give your teeth an extra boost of white from the temporary tooth dehydration that whitening products cause. The ratio of the number of female bees to male bees in any hive is phi. The Nautilus is a mollusk shell that adjusts itâs buoyancy by pumping gas into chambers. The ratio of each spirals diameter to the next is 1.618 to 1. In Sunflower seed heads the seeds grow in opposing spirals – the ratio of each spirals diameter to the net is phi. Spiraled Pine cone petals exhibit the same feature as the Nautilus. Our bodies – The Vitruvian Man by DaVinci exhibits the golden proportion with respect to the ratios of : Total Height vs bellybutton to floor distance , Hip to floor vs knee to floor, as well as proportions of finger joints, toes, spinal divisions and more. Artwork â The Greek Parthenon, Pyramids of Egypt, Stradavarius violins, and even musical compositions. Gum-Line symmetry and height Ideally, the gum-line should follow a symmetrical pattern- both right and left sides should almost be mirror images of each other, and when smiling, should not show much, if they show at all. 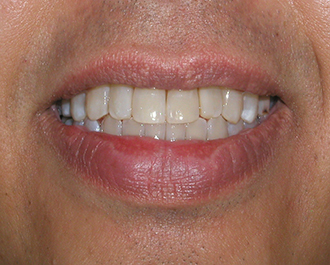 In an ideal smile the edges of the upper teeth appear to follow the lower lip. Achieving this can involve any combination of tooth reshaping, Invisalign, and/or porcelain veneers. The pictures for this would be the SmileBlack and SmileBlackwLine. Sometimes the bite can have a lot to do with why a smile looks the way it does. 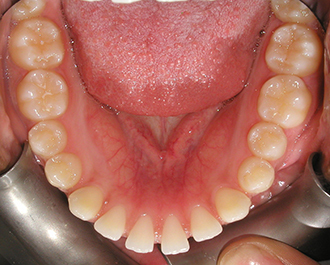 If lower teeth are crooked they may wear the upper teeth in an uneven pattern and sometimes it’s as important to correct lower teeth as the uppers (especially if they show a lot) . 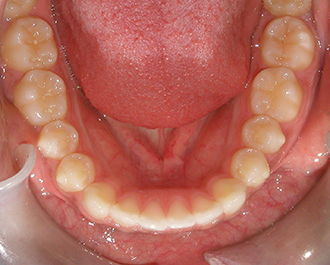 If the upper and lower front teeth are wide apart when biting on the back teeth, moving them together with Invisalign can be the answer. 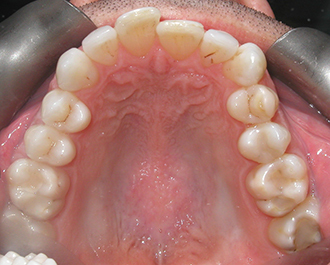 Many people grind their teeth during the night and the resulting wear on their teeth can make their front teeth short and/or ragged. Triangles (Embrasures) â This really has to be explained with a photograph. 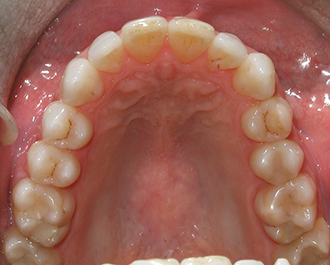 The triangles that are formed by the gaps at the edges between front teeth should get larger from the center as you go back. 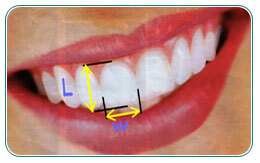 Visibility of the teeth when smiling or at rest  When smiling most of the upper front teeth should show, and ideally some should show even when you open your mouth slightly.